Theater has long been a see-saw balance of tragedy and comedy, with an occasional dip into dramedy, where the elements involved both vie for top billing. In Mike Reiss' world premiere production "Comedy Is Hard!" two long time veteran performers struggle to find an answer that satisfies them both. Set in their twilight years, both Kay and Lou have graced the stage for decades, Kay as a dedicated actress of drama and Lou doing it all for laughs. He is 84 years young and is trapped in a wheelchair due to a stroke. She is 60+12 and also finds herself in a wheelchair due to a slip in the shower. 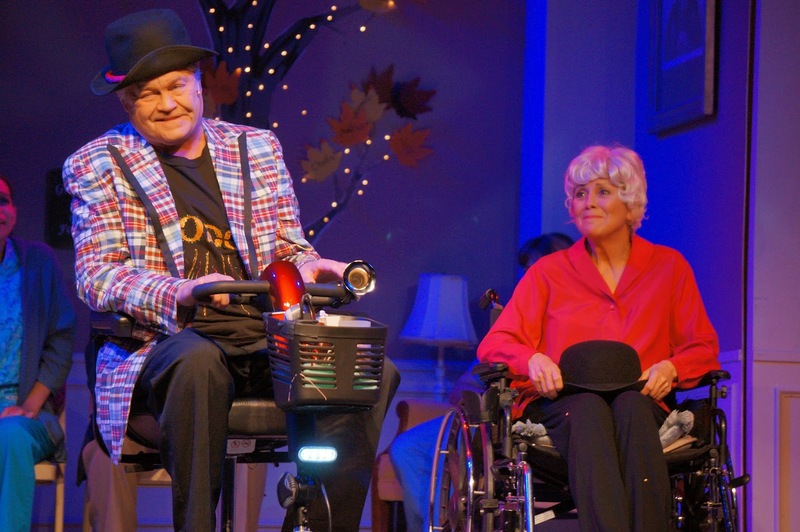 Fortunately for the audience, Kay is the delightful Joyce DeWitt from "Three's Company" and Lou is the favorite Monkees' star Mickey Dolenz. Ivoryton Playhouse will be free wheeling this theatrical debate until Sunday, October 12 for your entertainment pleasure. When the two meet in a park in Manhattan, Kay is with her almost non-verbal nurse Valentina (Dorian Mendez) and Lou is being ferried around by his uncooperative son Phil (Michael McDermott). They share their history on the stage and argue over whose career is more meaningful and deserving of praise. Along the way, they find themselves in The Actors Home in New Jersey and encounter diverse objects, situations and personages from Tinkerbell to Elmo to Angela Lansbury, disco balls, bicycle bells to balloons, pancakes to tuna fish sandwiches, to Canadians who have yet to learn to laugh to mysterious ladies sporting red berets. When the pair decide to put on a play, Beckett's "Waiting for Godot," the age old question of which is harder and has more value, comedy or tragedy, has a chance of being answered. This end of life story is sweetness with a tinge of sadness. Jacqueline Hubbard directs it with a poignancy that lends its authenticity. Also in the cast are a homeless man (Michael Hotkowski) and a retired actor (Dan Coyle) who add color to the tale. Mike Reiss' sense of humor is evident throughout as his one liners create chuckles, giggles and guffaws. For tickets ($42, seniors $37, students $20 and children $15), call the Ivoryton Playhouse, 103 Main Street, Ivoryton at 860-767-7318 or online at www.ivorytonplayhouse.org. Performances are Wednesday at 2 p.m. and 7:30 p.m., Thursday at 7:30 p.m., Friday at 8 p.m., Saturday at 8 p.m. and Sunday at 2 p.m. Put your mask of comedy firmly in place as Joyce DeWitt and Mickey Dolenz invite you into their world of entertainment, courtesy of funny man Mike Reiss. Eugene Morris Jerome is a lot of name for a teenager to carry around, especially if his goal is to be a Yankee ball player named Joe. Eugene is philosophical enough to know if he can't be a star on the mound, he may well be a writer. If writers need to suffer, he feels his name is a good start and his complicated family life will push him miles along to winning a Pulitzer Prize. Carey Cannata is wonderful as the growing into puberty Eugene who accepts that no matter what happens in his lower middle-class Brighton Beach home in Brooklyn he will be blamed. Forget that the household includes his dad Jack (Michael Iannucci), his mother Kate (Sarah Knapp), his older brother Stanley (Robert Mueller) as well as his mom's sister's family, Blanche (Elizabeth Donnelly) and her girls Laurie (Hannah Hartmann) and Nora (Lauren Devine). The strain of having to feed and provide for so many family members is taking a toll on the patriarch Jack and adds a health burden to the everyday problems. This involving tale is a semi-autobiograhical one credited to playwright Neil Simon and is part one of a trilogy. 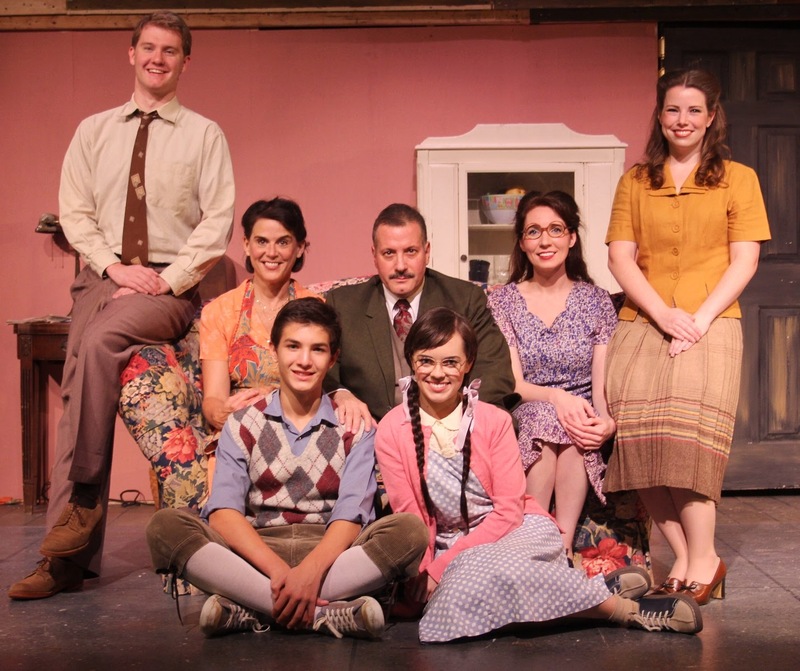 "Brighton Beach Memoirs" is being lovingly created on stage by director Semina DeLaurentis at Seven Angels Theatre in Waterbury until Sunday, October 19. Eugene talks directly to the audience and confesses, reveals, discloses and shares everything that goes on under the Jerome roof, from the agony of having liver and onions for dinner to the awakening of sexual stirrings for his cousin Nora and how those feelings make him react. Luckily Eugene has a big brother who can open the bathroom door and explain all those weird feelings brought on by puberty. But those are only the tip of Eugene's Golden Palace of the Himalayas. The family has money troubles, long buried feelings of envy and resentment, gambling issues, fears about an approaching war, lost opportunities on the stage, health issues that affect productivity, prejudices, loneliness and self-pity, plus Eugene's fixation on naked women. And don't forget this is a comedy! The entire cast is perfectly in tune and talented for every nuance. We grieve with Nora's chances that are dashed and Blanche's promise of love that is squashed so soon. We commiserate with Stanley on his dilemma about principles versus practicality. We understand Kate's worries about everyone she holds dear. The year is 1937 and the world is fast approaching a momentous decision. Daniel Husvar's two layered set makes us privy to all the aspects of family life in this Brooklyn homestead. Thursday at 2 p.m. and 8 p.m., Friday at 8 p.m., Saturday at 2 p.m. and 8 p.m. and Sunday at 2 p.m. The theater is just off I-84 and parking is free. Music legend Little Anthony will bop, roll and rock into Seven Angels on Wednesday, October 8 at 7 p.m. to sing and share his life story. His new book "My Journey-My Destiny" will be available for signature. Purchase tickets and books online and save, $37.50 (with book $55) to $42.50 (with book $60). Watch Eugene Morris Jerome officially end his childhood and march into puberty straight through the doors of the Golden Palace of the Himalayas. 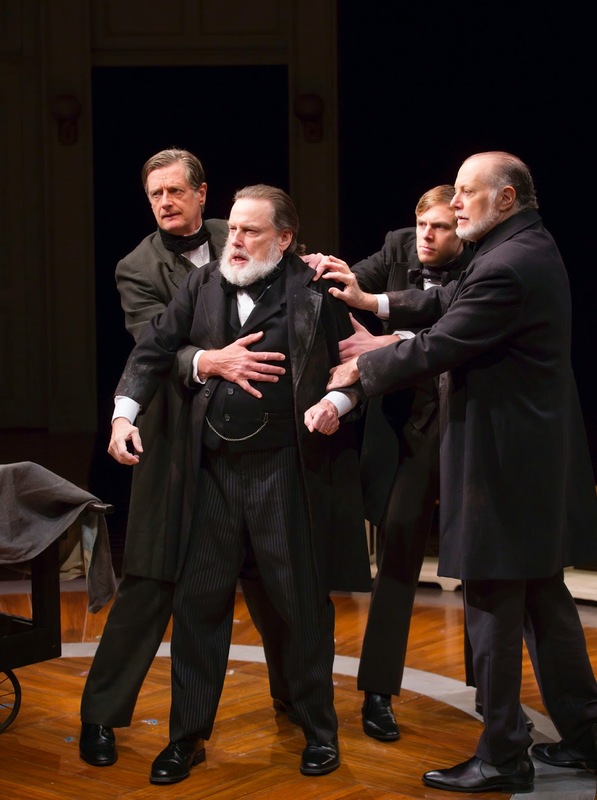 INHALE THE MYSTERY OF "THE ETHER DOME"
If you have a dental appointment or surgery scheduled in the near future, you may want to postpone seeing "The Ether Dome" by Elizabeth Egloff at the Hartford Stage until Sunday, October 5. A bit squeamish and uncomfortable around medical procedures, if you close your eyes when the plebotomist draws vials of your blood, you may want to prepare yourself for this dose of medical reality. Now that you have been forewarned, the brave of heart and intrepid souls can attend and partake of a scientific mystery worthy of a Sherlock Holmes. Hartford, Connecticut gets full credit and kudos for a major breakthrough in the world of dentistry and anesthesia. 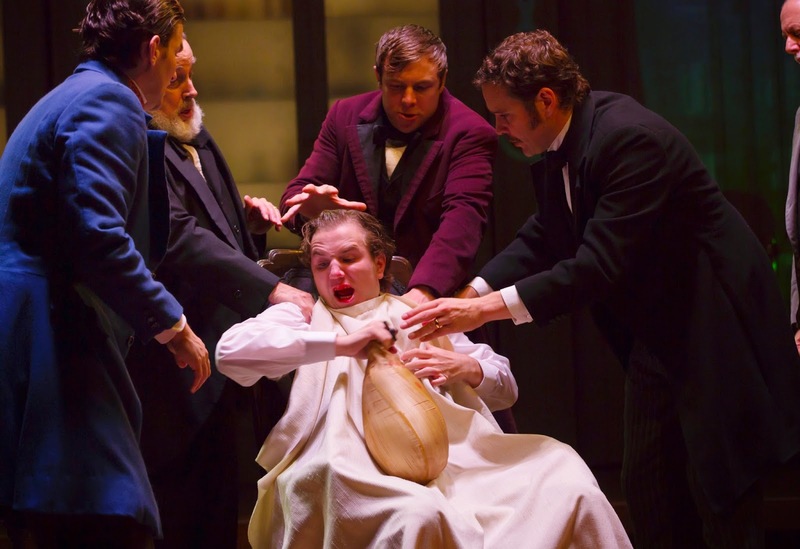 Dr, Horace Wells (Michael Bakkensen) and his student William Morton (Tom Patterson) began the journey to find a substance to reduce and alleviate pain and suffering in 1846. Through trial and error, an accident and experimentation, the pair first used laughing gas or nitrous oxide, to put patients to sleep temporarily while their diseased teeth were extracted. The first official demonstration took pace on October 16, 1846 in Massachusetts General Hospital's surgical amphitheater, now known as the Ether Dome, when Morton used the anesthetic ether for surgery on a patient's tumor. Previously for dental extractions, a patient's ankles were tied together and they were force feed everything from vinegar and brandy, milk and turpentine. Some committed suicide rather than go through the excruciating pain. The accidental discovery of the incredible numbing properties of first laughing gas and later ether revolutionized medical and dental procedures. With egos and expectations vying for credit, physicians like Dr. Bigelow (Greg Balla), Dr. Gould (Ken Cheeseman), Dr. Warren (Richmond Hoxie), Dr Hayward (Bill Kux) Dr Colton (Lee Sellars) and Dr. Jackson (William Youmans) of Harvard fame all tried to insinuate themselves into the fray. The calming influence of Lizzie Morton (Liba Vaynberg) and Elizabeth Wells (Amelia Pedlow) had little influence on the growing anger and envy and animosity between their husbands over who deserved the praise for the discovery. This historical saga plays out in dramatic form under the direction of Michael Wilson, who had the initial idea for the play back in 2005. The visual projections of James Youmans's set design enhance the production. For tickets ($25-85), call the Hartford Stage, 50 Church Street, Hartford at 860-527-5151 or online at www.hartfordstage.org. Performances are Tuesday at 7:30 p.m., Wednesday at 2 p.m. or 7:30 p.m., Thursday at 7:30 p.m., Friday at 8 p.m., Saturday at 2 p.m. or 8 p.m. and Sunday at 2 p.m.
Before you take a whiff of any gaseous compound, get caught up in the tale of betrayal, envy, greed and egotists that is the east coast premiere of "The Ether Dome." 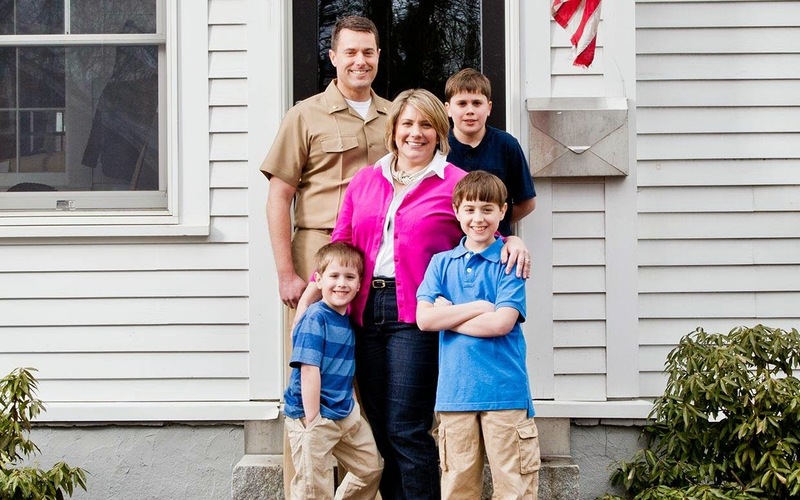 When Sarah Smiley's husband Dustin, a Navy pilot, was deployed overseas for a year, she was left with a small town life in Maine, three young boys to raise and an empty chair at the dinner table. With no lack of trepidation, an aversion to cooking and a dislike for entertaining, she did what any other mother in the same set of circumstances would do: she invited everyone from neighbors to politicians to policemen to dinner one night a week for a year. Along the way Sarah Smiley, a syndicated newspaper columnist writing "I'm Just Saying," realized the life lessons she and her boys were learning and the incredible impact those meals had on their guests, she recorded their experiences in a book "Dinner with the Smileys." Unfortunately it took the death of an elderly neighbor in a nursing home who died the week before they planned to visit, to bring home the message about not postponing a good deed. That missed opportunity was turned around when the boys insisted they visit anyway and a man named Frank invited them to have dinner with him, since his beloved wife of 60 years had Alzheimer's and didn't know him any more. Needless to say, the meal was a little soggy with tears. R. J. Julia's Booksellers, 768 Boston Post Road, Madison commemorated Sarah's visit to town recently with, you guessed it, an old-fashioned potluck supper. While Sarah served turkey lasagna (Garfield the cat would have approved) 90% of the time, it wasn't the menu that impressed the 250 strangers who crossed their doorstep. Along the way, those strangers became friends and the town became a community. The boys learned manners and how to socialize (we won't mention the time the minister who was dining that night found two of the boys wrestling on the kitchen floor and promptly sent them to their room). One of their favorites (although the middle son Owen doesn't want to hurt anyone's feelings by naming a favorite) was a U.S. Marshal who came because people kept telling her to invite him. The guests from the Governor of Maine John Baldacci to the local fireman to an Olympic Gold Medalist all left an impression, There are a lot of lonely people who would like a dinner invitation (even if it's a Senator who gets a paper towel instead of a cloth napkin) and Sarah Smiley and sons Ford, 14, Owen, 12, and Lindell, 8, encourage you to invite one or three over. You'll all be the richer and wiser for it. The oven mitt is on the other hand these days as Dustin is now home with the boys, while Sarah is on her book tour. Dustin is trying to figure out what to make for the company the boys are inviting to fill mom's empty seat at the dinner table. Grab a beer or a mug of eggnog ( or as some term it Keg Nog), put some tinsel on your pink flamingo, and mosey over to Armadillo Acres for a rip-roaring holiday celebration. With a trio of archangels or wise women as your guides, Betty (Maureen Pollard), Lin, short for Linoleum (Shawn Rucker) and Pickles (Liz Swan), you'll be in good hands as you navigate your way to "The Great American Trailer Park Christmas Musical" lighting up trees and double wides at Norwich's Spirit of Broadway Theater until Sunday, October 5. This is slightly X-rated holiday fare, filled like a Christmas stocking, with F-bombs and feisty folk who speak their minds in red and green spiked trailer park colorful speech. It's twelve days before Santa is due and the Florida trailer park fears its holiday curse is about to descend once again. For the last dozen years, manager Betty has been writing letters to attract the magazine "Mobile Home and Garden" to judge their decorations to win a coveted $10,000 prize. This year they are actually in the contest and every home is spotting the finest beer can doodads. All is in readiness, except for the space owned by one member, Darlene, a true Grinch and Scrooge combined. Fortuitously, a funny thing happens to Darlene, a mean-spirited Jenn Rykowski, and she accidentally gives herself a giant jolt of electricity and awakens with a gift-wrapped case of amnesia. As her next-door neighbor Rufus, a kindly Rob Grgach, attends to her, the trio of Betty, Lin and Pickles pray she won't recover too quickly. As strange as it seems, an early Christmas miracle has occurred. Darlene wakes up nice, with all her naughtiness shocked out of her. Even when her bombastic boyfriend Jackie, a silver seguined Brett Bernardini swaggers in, Darlene has no memory of him or of her employment as a waitress at Stacks, the pancake joint he owns. Will Armadillo Acres win the big money prize? Will Darlene's amnesia last long enough to hold off the curse? Will the gift she can't open until Christmas turn out to be Darlene's salvation? Is a Merry Christmas destined to bring peace and good will? Lisa Foss has found a jolly source of fun to make the musical by David Nehls, music, and Betsy Kelso, book and lyrics, merry and memorable, with Dan Brandl leading the band. or online at www.spiritofbroadway.org or SBT@99main.com. Performances are Wednesday and Thursday at 7 p.m., Friday and Saturday at 8 p.m. and Sunday at 2 p.m.
Watch in October for a series of festive meals entitled "Night of 100 Dinners" all to benefit the theater with Jackie Roy in charge. Call her if you'd like to host a dinner, cocktail party, picnic or whatever rings your bell. Call her at 860-887-6975 or online at jackieroy6020@gmail.com. Celebrate Christmas in September with garlands of red and green lights and a bottle of Bud and feel free to dress in your best trailer park garb. Every community has characteristics that mark its identity and, by extension, the people who inhabit it. Clinging to traditions and resisting change are indicative of a staunchness of principle, an abhorrence of the encroachment of modernity, a comfort in maintaining what has worked for generations in the past. John Warley has written a wonderfully engaging novel about knocking on the doors of tradition to open them wide to the fresh air of progress. In his new book "A Southern Girl," he exposes the narrow mindedness that can paralyze and stultify modes of thinking, where the idea of change is frighteningly avoided, setting his tale in the Southern bastion of Charleston. His story is partly autobiographical. He and his wife and two sons opened their home and hearts to adopt a baby daughter Mary Beth. How similar or unlike MaryBeth is from Allison in his fictional tale can only be determined by the author himself. With an eloquence for words, the reader is swept into the journey of Coleman and Elizabeth Carter and how one tiny infant from South Korea changed their lives irrevocably. The attorney in Coleman initially resisted his liberal wife Elizabeth's proposal to bring a "foreigner" into their midst.. If Coleman was resistant, his parents were apoplexic. As noble and honored Southerners, adopting "an unknown entity" was unthinkable. But Elizabeth's wishes prevailed and the Carter family adjusted in a hundred different ways as the sweet new one captured their hearts. "A Southern Girl" carries the reader through a magnolia strewn path of changes as Allie, an avid horse lover, grows into her own person. Along the way we meet fascinating people like Hana, Jong Sim, Mr. Quan and Natalie. The early death of Elizabeth, as well as the passing of Coleman's father and the much earlier death of Coleman's good friend Philip, bring turning points to the family. It is only when Allie, considered a outsider by Southern standards, is snubbed by the elite coming-out ball held by the St. Simeon Society, that Coleman faces the prejudices that the genteel community clings to so fiercely, like the creeping vine kudzu that chokes whatever it comes in contact with. 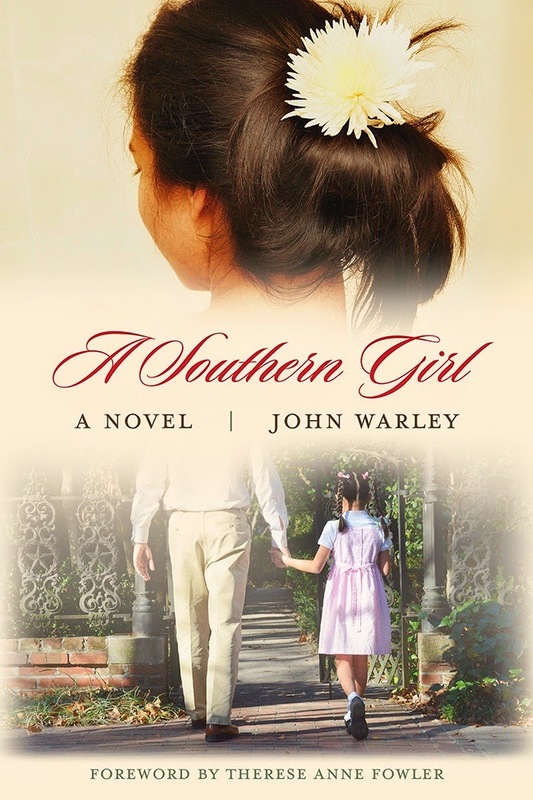 How Coleman rises to the occasion, to fight for his daughter's rightful place of honor, is at the compelling center of "A Southern Girl." With lawyer-like skills and a determination his late wife Elizabeth's would applaud, Coleman questions the establishment, protecting his own child at great personal cost. Let John Warley, who left his own legal career for several years and took his family to San Miguel de Allende, Mexico, to write this inspiring novel, sweep you along on Coleman Carter's journey as a man, husband, parent, friend and warrior. Imagine a full fledged musical on stage that is being created right before your eyes, with your suggestions. Never before seen and unlikely to ever be seen again, this is truly a once-in-a-lifetime entertainment event. Get your ideas ready, for the orchestra will be tuning up and the actors are about to take their places for Broadway’s Next H!t Musical one night only at Fairfield University's Regina Quick Center on Friday, September 19 at 8 p.m.
Talk about new and different and thinking on your feet. This is improvisation with music, not something you see every day or that just any performer is capable of designing. Under the direction of improv veterans Rob Schiffman and Deb Rabbai, Broadway’s Next H!t Musical was hailed as “brilliant” by TheaterWeek. The New York Times calls it “Hilarious!”, and The New York Post described the show as “remarkable.” Time Out NY says “At last! A musical of, for, and by the people.” Broadway's Next Hit Musical has been seen recently at The Triad, Tribeca Film Festival, and at the New York Musical Theater Festival, among many others, presenting improvisational musical comedy theater at its very best. Tickets ($35, 40, 45, students at Fairfield University $5) are available through the Quick Center Box Office: (203) 254-4010, or toll-free 1-877-ARTS-396. (1-877-278-7396). Tickets can also be purchased online at www.quickcenter.com. talented troupe expanded on my idea as well as three others and Kermit and the Monsters was selected as the full fledged musical with choreography by Bob (not Fosse). You had to be there! Growing up in abject poverty, illegitimate, with no apparent advantages, Eva Peron transformed herself into a woman of power and prestige. As the second wife of Argentina's president Juan Peron, she effectively ruled a nation. With aspirations of being an actress, she developed a fascinating knack of seduction, a role she used over and over again to advance her position in society. Eventually she used her beauty and charm and seduced an entire nation. To uncover the tale of this high flying poseur, sail into the Bushnell Center for the Performing Arts from Tuesday, September 23 to Sunday, September 28 for Andrew Lloyd Webber and Tim Rice's memorable musical "Evita." The story begins on July 26, 1952, the fateful day Eva exits this world, as her heartbroken fans and faithful followers mourn the loss of their self-appointed queen. The storyteller Che, an everyman of the working class, has no love lost feelings for her and turns the clock back to reveal all her layers and dreams of glory. Che (Max Quinlan) introduces the teenage Eva (Caroline Bowman) and tracks her insidious trail as she promotes herself as an actress and singer, always in sight of the brass ring of fame. Without any qualms, she trades her body for one more rung up society's ladder, using roles as a model, radio star and actress to get closer and closer to her goal. Politics enters her focus sight with the ascension of Colonel Juan Peron (Sean McLaughlin) to the military stage. She entangles her life with his, convincing him "I'd Be Surprising Good For You." Convincing Peron first, she then sets out to promote him to President, with herself by his side. Initially rejected by high society, she succeeds in compelling the populace that she is a savior, a champion of the poor, in "Don't Cry For Me, Argentina." The rest of her brief life is told in scenes of her travels to Europe and her reception back at home, from "Rainbow High" to "Eva's Final Lament." Was she sinner or saint or somewhere in between? 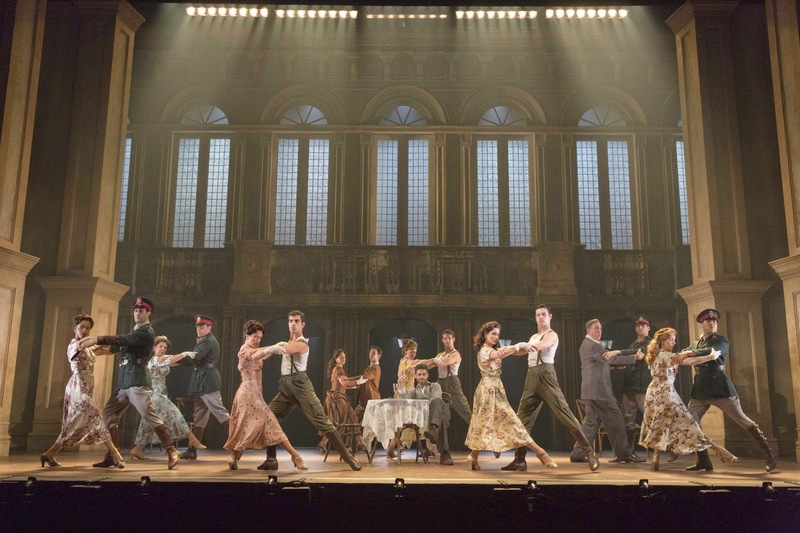 "Evita" is a monumental tribute to the myths and mystery that swirl around her as dramatically directed by Michael Grandage. For tickets ($21 and up), call the Bushnell, 166 Capitol Avenue, Hartford at 860-987-5900 or online at www.bushnell.org. 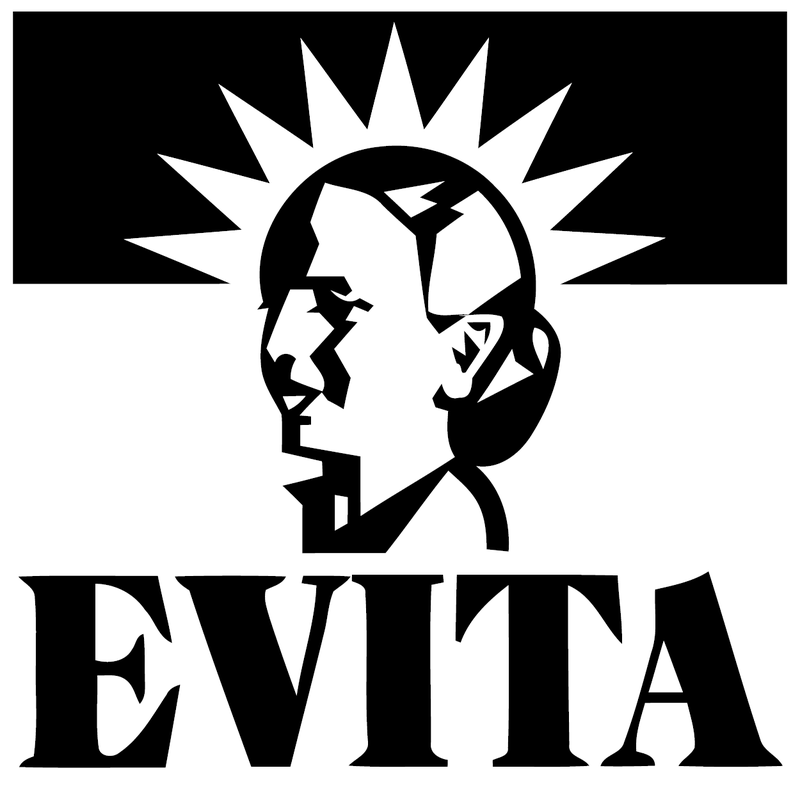 Performances are Tuesday - Thursday at 7:30 p.m., Friday at 8 p.m., Saturday at 2 p.m. and 8 p.m. and Sunday at 1 p.m. and 6:30 p.m.
As the First Lady of Argentina, Eva Peron, known affectionately as Evita, overcame great obstacles to achieve lofty heights, enduring tragedy and demonstrating passions along the way. What could be more meaningful than making a difference in a child's life? By volunteering just one hour a week, you can be partnered with a local school child and help develop a love of reading. No previous experience, no problem.The Jewish Coalition for Literacy (JCL) is prepared to train and place you in a rewarding one-on-one situation that will impact the student in positive ways, improve their reading skills and help them gain confidence through individualized help. On Wednesday, September 17 at 9:30 a.m. at the Jewish Community Center, 360 Amity Road, Woodbridge, an orientation meeting will be held featuring Fay E. Brown, Ph.D.Associate Research Scientist, Yale Child Study Center; Krista Bergin, Literacy Intervention Facilitator, New Haven Board of Ed and Cheryl C. Durwin, Ph.D., Professor of Psychology Assistant Chairperson, Psychology Department, SCSU, an esteemed panel that will present best practices of reading with a child and highlight the importance of reading partners offering children a nurturing opportunity to help them succeed. You will be able to choose the school, grade level, day of the week and hour of the day to be teamed with a welcoming student. Call 203-387-2424, ex. 308 or online at bbrenner@jewishnewhaven.org. Give of yourself to this worthy cause and you will be all the better for it. 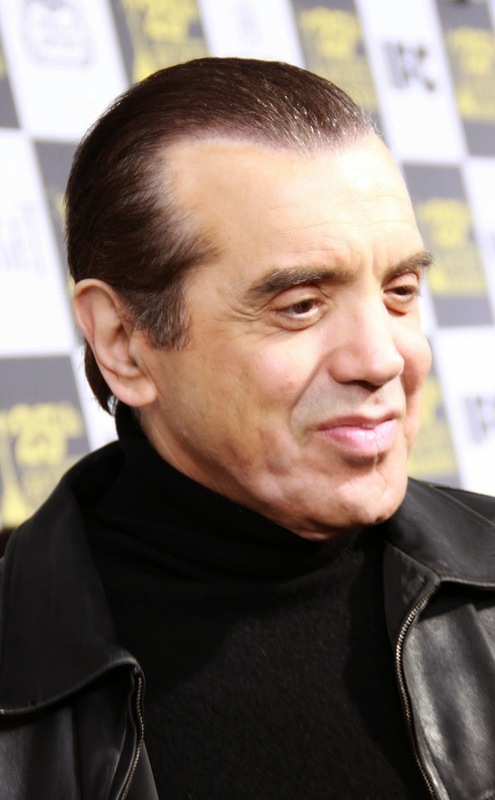 Chazz Palminteri has quite a tale to tell and he makes it come alive with skill and talent. He brings along a colorful string of characters, friends he grew up with, like Louis Beans, Frankie Coffeecake, Joe-Joe the Whale, Jimmy Blue Eyes, Mikie GaGa and Johnny 10 to 2. If you see he will be performing "A Bronx Tale," run don't walk to the box office and secure your ticket. On Saturday, September 6 actor and storyteller Chazz Palminteri brought the assembled crowd to a standing ovation at the Fox Theater at Foxwoods Resort Casino with his moving play "A Bronx Tale," a story he lived that phenomenally changed the course of his life. Witnessing a murder at any age is traumatic, but for an impressionable nine year old lad it can be devastating. Chazz was sitting on his front stoop, in his Bronx neighborhood, when the unthinkable happened. How to process such an episode of violence? What to tell the police? Why did it happen? What would the church dictate he do? in "A Bronx Tale," Palminteri relives his youth, writing the story in bits and pieces for an acting class, adding minute by suspenseful minute until it culminated at one hour and forty minutes of drama. On stage, he inhabits eighteen different characters, focusing mainly on the two father figures who dominated his growing up years: his father Lorenzo and the man who committed the murder he witnessed, the "boss of all bosses," the capo di tutti capi, Sonny. His morally righteous dad was at odds with his rival Sonny who commanded by instilling fear in his opponents. From both men, Chazz learned life lessons about how to conduct himself, principles that have served him well. Neither man wanted him to waste his talents on a life of crime. Sonny wanted Chazz to be his redemption. Now Palminteri rules the stage with authority, paying homage to those long ago years. The play has since been adapted for the big screen, with Robert DeNiro as Lorenzo and Chazz as Sonny, with DeNiro making his directorial debut. Don't miss "A Bronx Tale" whenever this actor and master storyteller brings his life- altering youth to amazing life. To Mary Richards, the insecure newspaper columnist on television, he was her grumpy curmudgeon of a boss, Lou Grant. In the animated world, he was the gruff speaking Carl Fredericksen in the Disney Pixar film "Up" where he takes a memorable balloon ride with an eager to please Boy Scout. He has also popped up on "Royal Pains," "Hot in Cleveland," "Roots," "Rich Man, Poor Man," "Hawaii Five-0," "Law and Order: SVU" as well as a host of others. 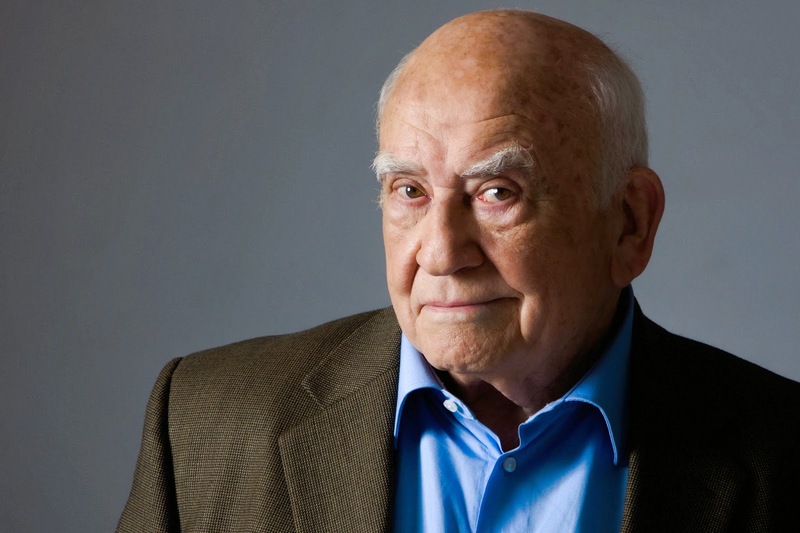 To become reacquainted with the stage, screen and television star Ed Asner, in an up close and personal way, plan on attending "Ed Asner - A Live Interview on Stage," part of the American Legend Series on Sunday, September 14 at 3 p.m. This spirited discussion, which includes film clips of his long and varied career will take place at The Edgerton Center for the Performing Arts on the campus of Sacred Heart University, 5151 Park Avenue, Fairfield (exit 47, off the Merritt). Jerry Goehring, the Executive Director of The Edgerton Center, will conduct the interview in the style of an 'Actors Studio' format. Audience members will have the chance to ask questions of this honored actor. At the age of 84, Ed Asner can reflect back on a colorful career that started on the assembly line at General Motors. While in Europe, he served in the U.S. Army Signal Corps where he stepped on stage to perform for the first time. After his military service, he joined the Playwrights Theatre Company in Chicago but quickly changed directions to head to New York City to become part of the comedy troupe The Second City. Cast in detective shows, dramas, and westerns and even as the voice of Napoleon the cat, it wasn't until he landed the job as Lou Grant on The Mary Tyler Moore Show in 1970 that he truly made his mark. After the series ended, Asner was given his own show "Lou Grant" that played from 1977 to 1982, not a comedy but an hour long drama about journalism. Whether he plays Captain Davies, the conflicted captain of a slave ship, on "Roots," an equally dark role as Axel Jordache on "Rich Man, Poor Man," a former Pope on "Papa Giovanni," a famed orator Edward Everett on "The Gettysburg Address," Asner brings a distinction and commitment to every role. On the lighter side, he regularly appeared on "The Tonight Show with Jay Leno" in a bit entitled "Does This Impress Ed Asner?" where contestants performed stunts to wow the star. For tickets ($25, senior $15, students $10), call The Edgerton Center at 203-371-7908 or online at EdgertonCenter.org. Come meet Ed Asner, a man who has won more Emmy Awards than any other male actor, seven in all, five for Lou Grant. Come by entertained by a master. selection. Their eleven year old sons had a confrontation at a park, when Ben Raleigh took a bamboo stick and knocked out Henry Novak's two front teeth. To sit in on this memorable meeting, let the Connecticut Cabaret Theatre of Berlin provide you a front row seat when Yasmina Reza's "God of Carnage," translated by Christopher Hampton, is dramatically and comically staged weekends until Friday, October 10. What starts out as a calm and reasonable discussion of the issues soon escalates into an all out melee, including fisticuffs and verbal attacks. tears and tantrums. Civility disintegrates into barbarism as the two intelligent couples become more childish than their offspring, hurling four letter words and accusations freely and openly. Discover how coffee and kaflutti ( a fruit tart), a vase of tulips, a hamster, prized art books, aged rum, a hair dryer and incessant cell phone calls all combine to raise the level of responsibility to new heights. Kris McMurray has triple hats as director, producer and actor as Michael Novak, taking to the front of the stage for the first time in almost a decade. Kudos, Kris. 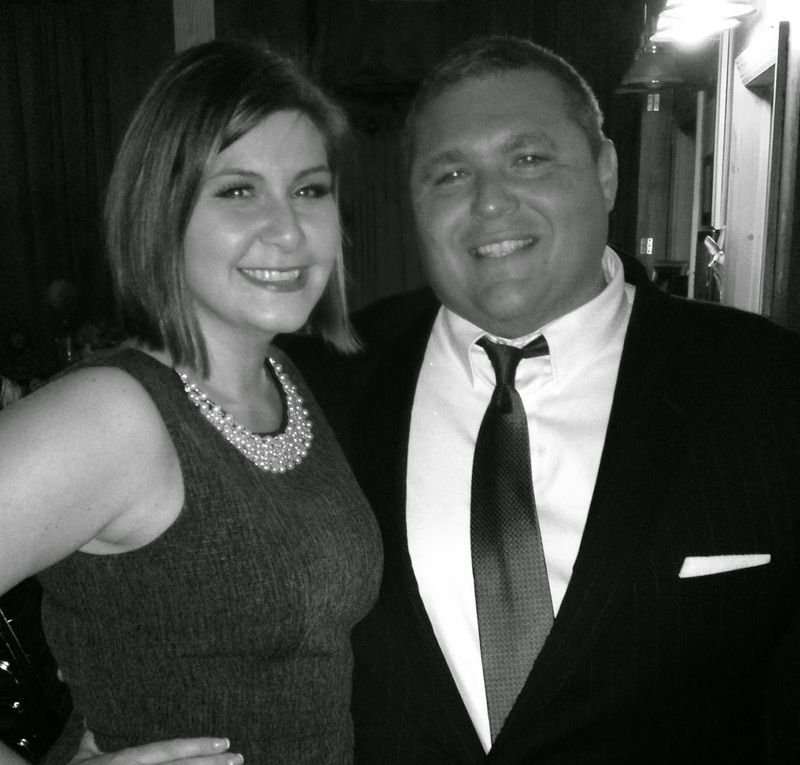 He is joined by Julie Lemos as his wife Veronica, Carleigh Schultz as Annette Raleigh and Joseph Mauriello as her hubby Alan. They are all spot-on great as the irritated and irate combatants. For tickets ($30), call CT Cabaret, 31-33 Webster Square Road, Berlin at 860-829-1248 or online at www.ctcabaret.com. Performances are Friday and Saturday evenings at 8 p.m., with doors opening at 7:15 p.m. Remember to bring goodies to share at your table or plan to buy refreshments on site. Come pick a side and root for the parents or the kids or for justice, the American flag and apple/pear pie. When actor and writer Chazz Palminteri was a nine year old boy sitting innocently on a cement stoop in front of his Bronx home, he witnessed a murder. He saw two men fighting five feet in front of him, ostensibly over a parking space, when a third man stepped in to help his friend. He killed his friend's opponent and, thus, rescued his friend. The police, no matter how they tried, couldn't get Chazz, who was called by his given name Calogero, to testify. In the midst of this devastating encounter, Chazz's eyes met those of the stranger's, who turned out to be Sonny, the capo di tutti capi, or "boss of all bosses" or godfather if you prefer. The young impressionable lad soon found himself swept into a different and exciting world that Sonny commanded, into a fancy club, fetching coffee and cutting lemons and limes, rolling dice and collecting tips. Chazz's father, a hardworking bus driver, did not approve of his son's new associates and when Sonny tried to give him a lucrative job he refused. Soon "C" as he was called became Sonny's "penance, something good to leave behind." Chazz was now influenced by two father figures. His dad Lorenzo gave him a card that stated "Don't waste your talent," while Sonny taught him life lessons like "It's better to be feared than to be loved" and "Never underestimate your enemy." Fast forward several decades and Chazz Palminteri, the aspiring actor, a dream he had harbored since he was ten, called out his memories of that long ago harrowing image and translated it into a ten minute monologue for an acting class. He had been at the Actor's Studio in New York City where he studied under Lee Strasberg and now was in Los Angeles looking for his big break. In between stints on television shows like "Hill Street Blues," he had a job as a doorman/bouncer at a high rollers club. A man was rude when he tried to enter and Chazz refused to let him pass. The patron exclaimed, "I'll have your job in 15 minutes." The boss suddenly appeared and hugged Swifty Lazar,a talent agent and deal maker to the stars, and, true to his word, Chazz found himself unemployed a quarter of an hour later. Searching for a good role and not finding one, the inventive actor set to work creating his own. The ten minute monologue about his early Bronx life grew minute by minute until it peaked at an hour and forty minutes long. Embracing eighteen different characters, he made it a one man show, "A Bronx Tale" that "exploded" when he produced it in a small club and suddenly became the hottest property since "Rocky" to hit the theater circuit. Offers of $250,000, $500,000 and, ultimately, a million dollars were offered to make it into a movie but never with Chazz in the main role as Sonny. With only $200 in the bank, it took a lot of chutzpah to stay focused on his dream. That dedication paid off when weeks later Robert DeNiro walked in one night and saw the show. He told Chazz at their second meeting, "If you make it (the film) with me, I'd make it right." With DeNiro directing his first film and playing Chazz's dad Lorenzo and Chazz as Sonny LoSpeechio, "A Bronx Tale" became a strong, witty, poignant coming of age tale by a master storyteller. Chazz recalls his early years as an "outrageous time to grow up. I had a great childhood in an Italian neighborhood with happy times, sports and some violence." Writing about it has proven therapeutic, "a transference of energy from negative to positive." He is grateful his father lived to see his success and his mom, now 94, can look forward to his upcoming appearances on "Modern Family" and "Legends" on television. To witness this classic performance, book your tickets ($75) for one night only, Saturday, September 6 at 8 p.m. when Chazz Palminteri will recreate his iconic "A Bronx Tale" at Foxwoods Resort Casino, at the Fox Theater, 350 Trolley Line Boulevard, Mashantucket. Call 800-200-2882 or online at www.foxwoods.com. A special three-course dinner package is available at Cedars Steak House or Al Dente for $130, from 5 p.m. to 8 p.m. that night only. Make reservations. Tax and tip are included. 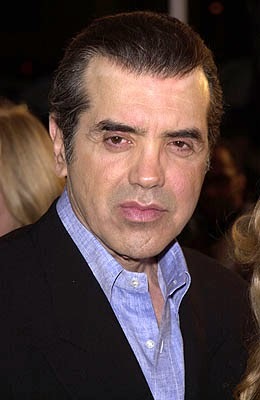 Chazz Palminteri is a man of many talents, none of which he wastes, as his father had warned. 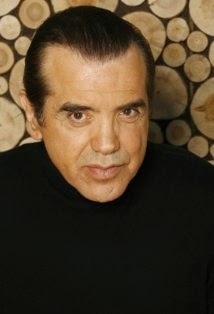 A veteran of 50 films like "Analyze This" and "The Usual Suspects," he also runs classes three or four times a year "One on One Auditions" and the website www.chazzpalminteri.net to "give back" and help young actors as well as hosts a new Baltimore restaurant "Chazz A Bronx Original." There his cold fire oven pizza cooks in 90 seconds, "sweet and fluffy on the inside, crispy and caramelized on the outside." As for those life lessons, Chazz Palminteri also has learned "family is important" and "stay close to the things you value." Come see him put all these lessons to good use. Take a walk back in history, and what an elegant heritage it is, when Waterbury's exquisite Palace Theater opens its doors for a tour on Friday, September 5 from 11 a.m. to 12:15 p.m. Don't worry if you can't make tomorrow's foray as the Palace has promised to repeat this grand backstage event many times in the autumn season. For nine decades, with only one sustained hiatus due to unforeseen events, the Palace has been a jewel in the entertainment world. This monthly historical talk, which is only $5, but make a reservation, will reveal stories and anecdotes from the theater's past and present glories. 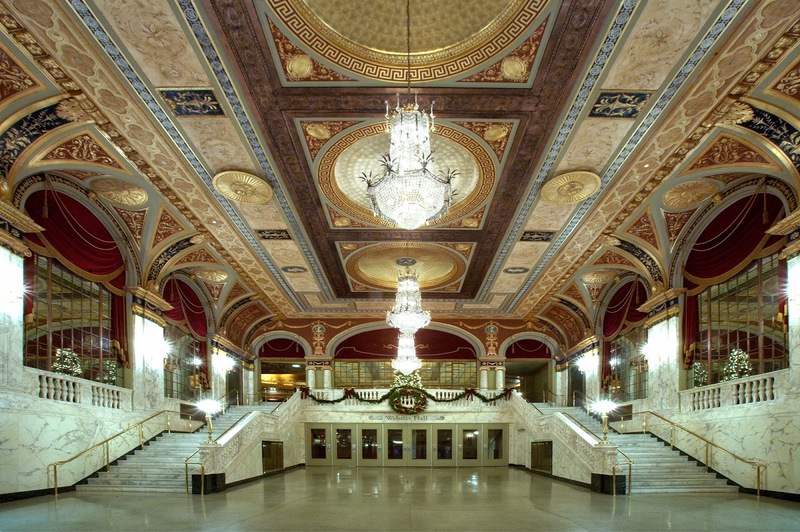 A trained staff of Palace Theater Ambassadors will be your guides, revealing all the delicious tidbits of knowledge that will make you feel you know this grand old lady, from her gilded and marble architectural design, her grand instrumental organs, her star dressing rooms and hidden backstage murals that illuminate the past in vivid color. Imagine walking across that great stage, the same space where over the years Tommy Dorsey, Tony Bennett, Eddie Cantor, Frank Sinatra, Jackie Gleason, Carol Burnett and Pink Floyd among many others trod the boards. Built in 1922 and a solid part of the National Register of Historic Places, the Palace Theater was designed in a Renaissance Revival style by architect Thomas Lamb and manages to beautifully combine Greek, Roman, Arabic and Federal motifs. 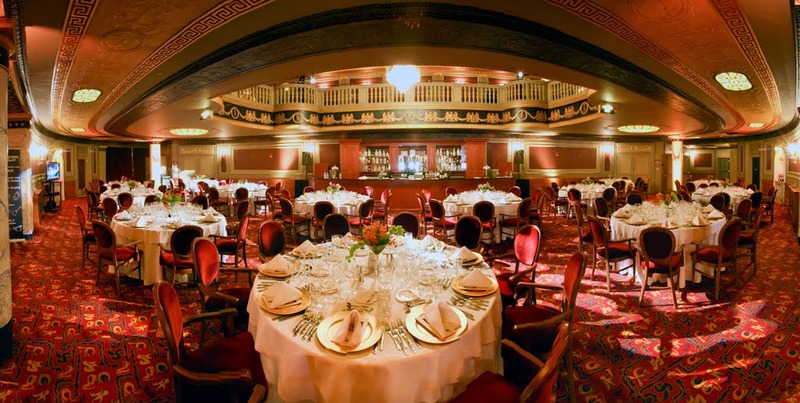 It was the brain child of theater impresario of Sylvester Z. Poli and was originally a vaudeville and silent movie house. It later welcomed talkies films, Big Bands, rock concerts and even later Broadway road shows. You will surely admire its sweeping marble staircases, golden domed ceilings, cut glass chandeliers and intricate plaster relief details that all attest to its grandeur and glory from the past to the present. It went dark in 1987 and stayed that way for a long 18 years. In 2004, it was revived thanks to a grant of $30,000,000 from the state of Connecticut and we are all the richer for it. A double anniversary will be held on Saturday evening, September 20 at 8 p.m. to celebrate the 80th year of WATR Radio, 1320 AM, and the Palace's tenth since its revitalization. Billed as a "razzle dazzle musical revue," it will weave together headlines from the radio with theatrical headliners, appropriately called "Headlines and Headliners." Tom Chute from WATR will direct and Brian Pia will orchestrate this unique one-of-a-kind evening that is sure to be a crowd pleaseer. Call for tickets ($35). For tour ickets ($5), call the Palace Theater, 100 East Main Street, Waterbury at 203-346-2000 or online at www.palacetheaterct.org. A special boxed lunch and tour package prepared by Riverhouse Catering for groups of 15 or more for $17 per person is available, reserved at least 3 days in advance. Come learn all the secrets hidden and all the beauty revealed on the surface that the Palace Theater in Waterbury has for the taking.